The floors are a living tangle of undulating fur. 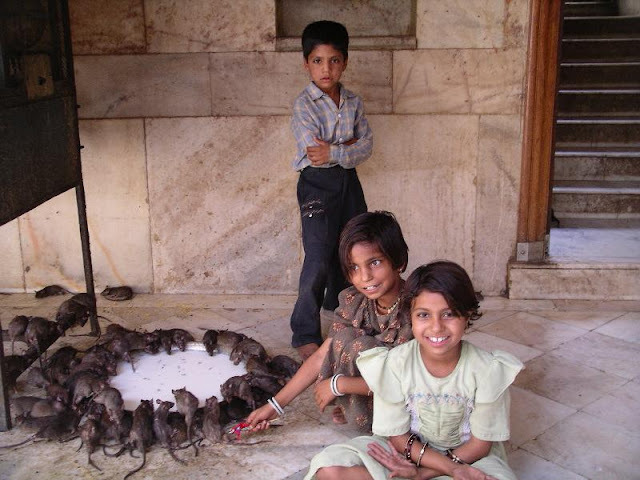 Small, brown blurs scurry across marble floors. 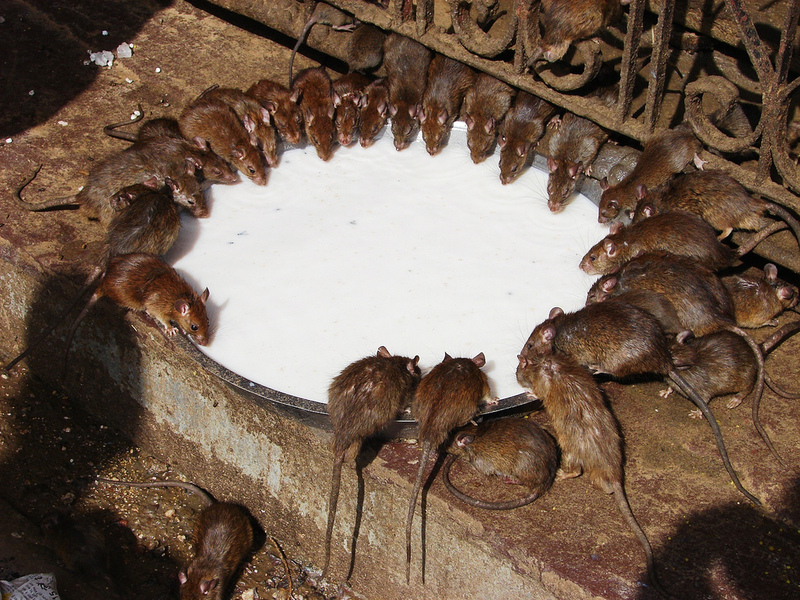 Thousands of rats dine with people and scamper over their feet. 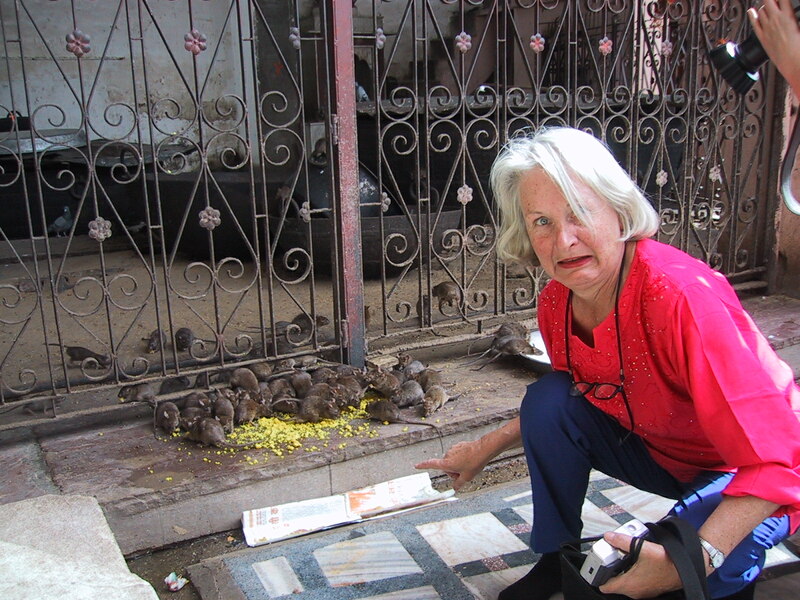 It may sound like a nightmare from the New York City subway to some, but in India's small northwestern city of Deshnoke, this is a place of worship: Rajastan's famous Karni Mata Temple. Karni Mata was a female Hindu sage born in the Charan caste and is worshiped as the incarnation of the goddess Durga by her followers. She is an official deity of the royal family of Jodhpur and Bikaner. During her lifetime, she laid the foundation stone of two of the important forts in Rajputana. She lived an ascetic life, and most of the temples dedicated to her were dedicated during her lifetime. 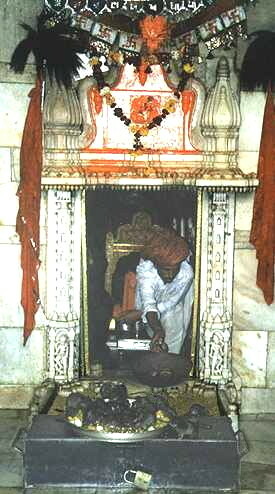 A temple dedicated to her during her lifetime differs from others in that it does not contain an image or idol of her but rather contains a foot-print to symbolize her visit to that place. The most famous of her temples is the temple of Deshnoke, which was created following her mysterious disappearance from her home. The temple is famous for its rats, which are treated as sacred and given protection in the temple. 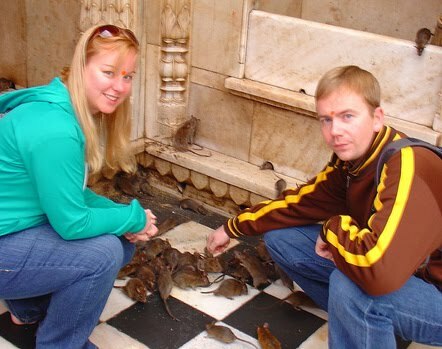 This temple is near to Bikaner and Nokha. 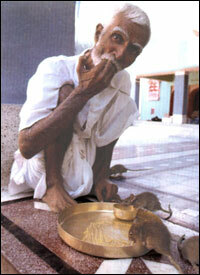 The second name of Karni mata is (Nari bai). Contrary to some reports, the temple is of the Hindu sect and is not affiliated with the Jain faith. 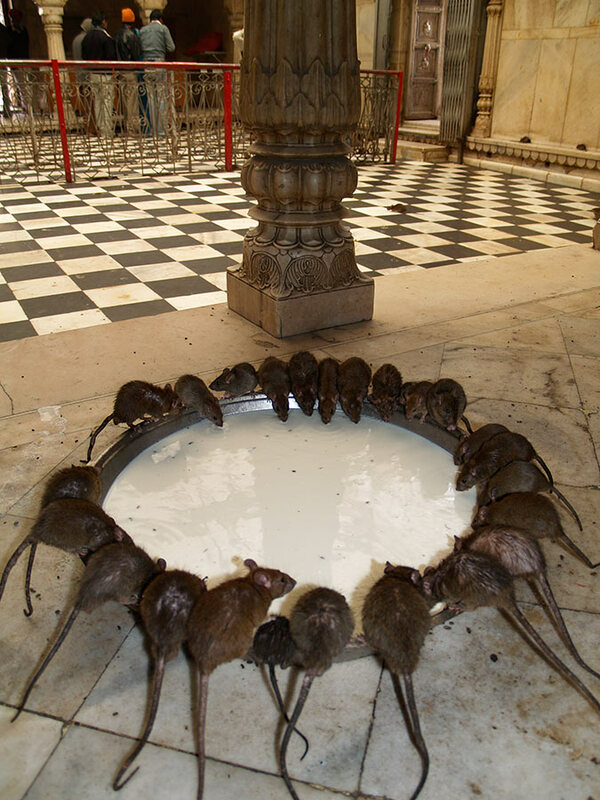 The Karni Mata temple at Deshnoke, 30 km from Bikaner, in its present form was completed in the early 20th century in the late Mughal style by Maharaja Ganga Singh of Bikaner. The temple was further enhanced by Kundanlal Verma of Hyderabad-based Karni Jewelers in 1999. The huge silver gates to the temple and the marble carvings were also donated by him. Throughout the year, pilgrims from around India visit to pay religious tribute to Karni Mata at the Deshnoke temple. Outside Rajasthan, she is respected and loved in areas such as Gujarat, Madhya Pradesh, and Haryana. 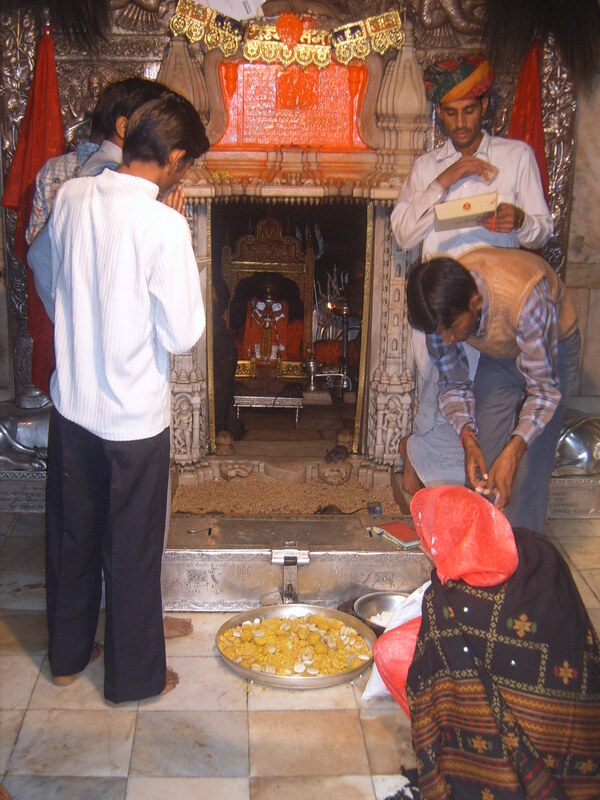 During Navratri thousands of people travel to the temple by foot. 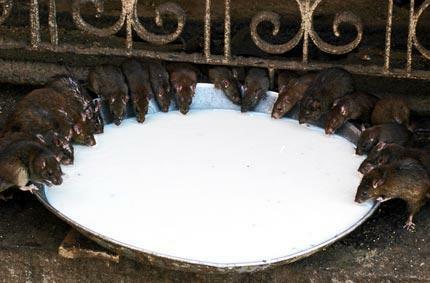 If one of the rats is killed, it must be replaced with one made of solid gold. 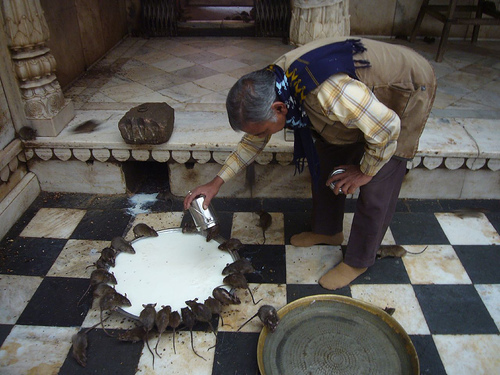 Sighting a white rat amidst hordes of black rats is considered specially auspicious. 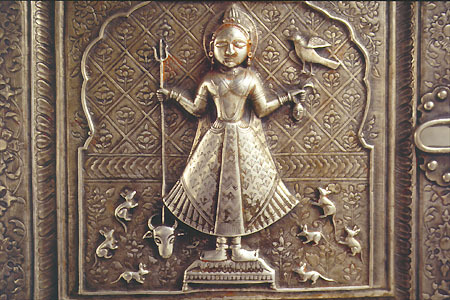 Karni Mata lived in the 14th century and performed many miracles during her life-time. When her youngest son, Lakhan, drowned, Karni Mata ordered Yama, the god of Death, to bring him back to life. Yama replied that he was unable to do this, but that Karni Mata, is an incarnation of Durga, could restore Lakhan's life. 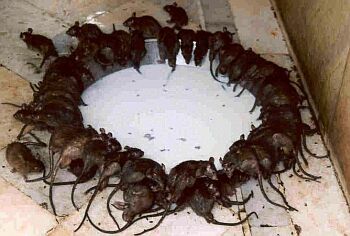 This she did, and decreed that members of her family would no longer die, but would be incarnated as kabas (rats), and these kabas would returns as members of her family. 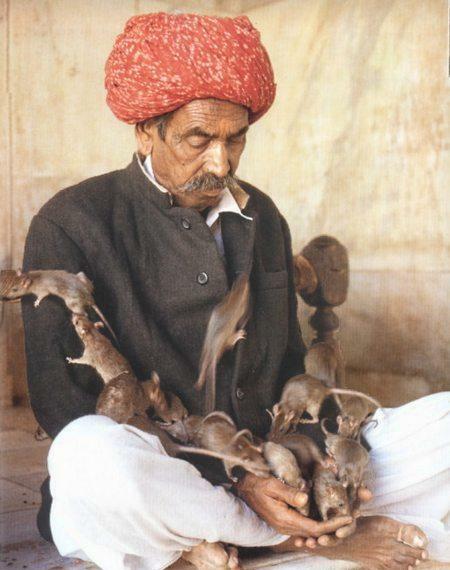 There are around 600 families in Deshnok who claim both decent from Karni Mata and that they will be reincarnated as kabas. The temple is an important place of pilgrimage, with pilgrims being disgorged every few minutes from buses. Before the temple, is a beautiful marble facade with solid silver doors donated by Maharaja Gaj Singh. Across the doorway to the inner sanctum are the repousse (raised relief) silver doors - one panel shows the goddess with her holy charges at her feet. 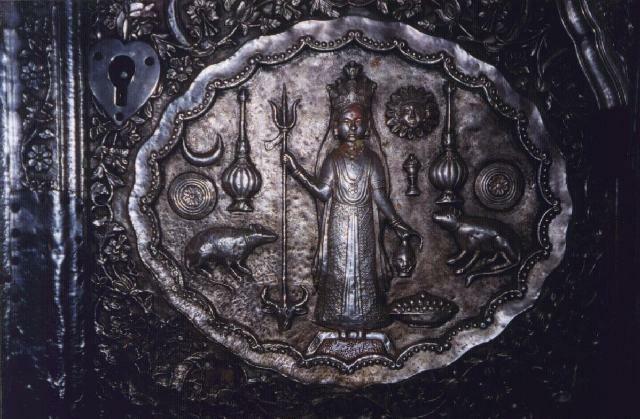 An image of goddess is enshrined in the sanctum. 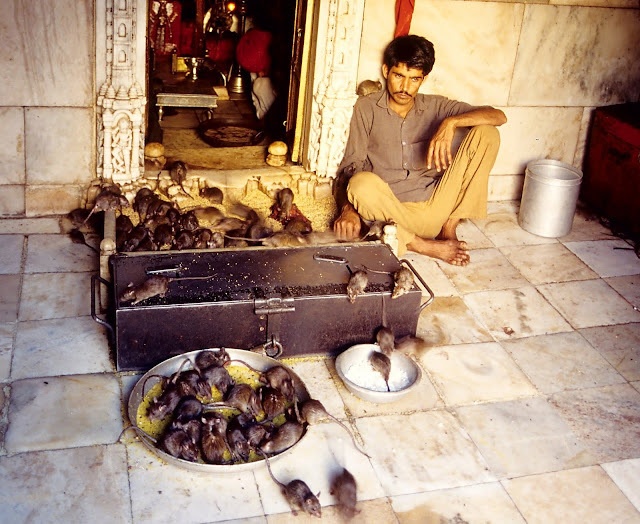 There are special holes around the temple courtyard to fascinate the rats' movements, and a wire grille has been placed over the courtyard to prevent the birds of prey and other predators consuming the holy rodents. It is considered quite auspicious to have a kaba run across your feet. White kabas are quite rare, albeit there are one or two at the temple and sightseeing one augurs well for your spiritual progress.